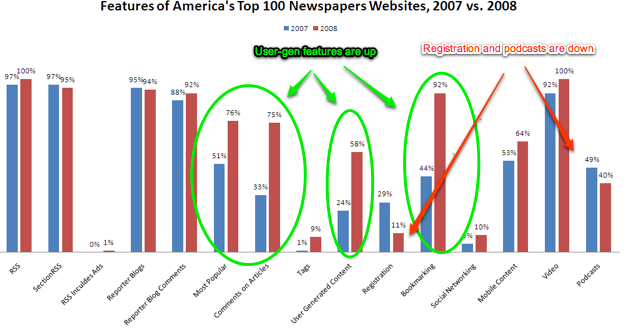 Newspapers are still lurching their way around the Web, a new study finds, but at least they are making some progress. The Bivings Group released a study today that quantifies the Website features of the top 100 newspapers in the U.S. Among the findings: Nearly every newspaper site has reporter-written blogs and some form of video; features that elicit content from readers are on the rise; podcasts and mandatory registrations are down; social networking features are pretty much non-existent. You can pretty much see all of the findings in two graphs, which I’ve marked up. (Click on the images for a larger view). 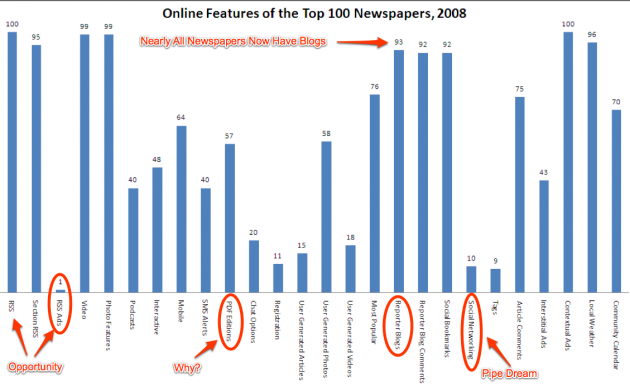 In the one above, which shows the penetration of all the online features on newspaper sites, 93 percent have reporter blogs and 100 percent offer articles in RSS feeds. Yet only one percent put ads in those RSS feeds. That seems like an opportunity, even though most RSS ads are complete garbage and readers hate them. In terms of reader-submitted material, newspapers are more comfortable accepting images than words. More newspaper sites accept photos from readers (58 percent) than videos (18 percent) or articles (15 percent). Comments are less controversial, with 75 percent allowing reader comments on articles. One thing I found curious is that 57 percent of newspaper sites offer their editions in PDF form. Why? A PDF of a page, maybe, but nobody prints out the whole edition. The graph below shows the biggest changes between this year and last. Newspaper sites that incorporate user-generated content is on the rise (58 percent in 2008, versus 24 percent in 2007), as are comments on articles (75 percent in 2008, versus 33 percent in 2007) and bookmarking (92 percent, versus 44 percent). Sites that require registration are down from 29 percent to 11 percent, which means that most newspapers have finally figured out that putting up any barriers, even a temporary one, between readers and articles simply drives readers to other sites.